Owl watchers along Route 1A/ Ocean Blvd in Rye just north of Rye Harbor, yesterday in the late morning. On my way to walk the dog I pulled over, rolled down my window and snapped a few pics too. Snowy Owl on a rooftop, patiently (sleepily) enduring the paparazzi. 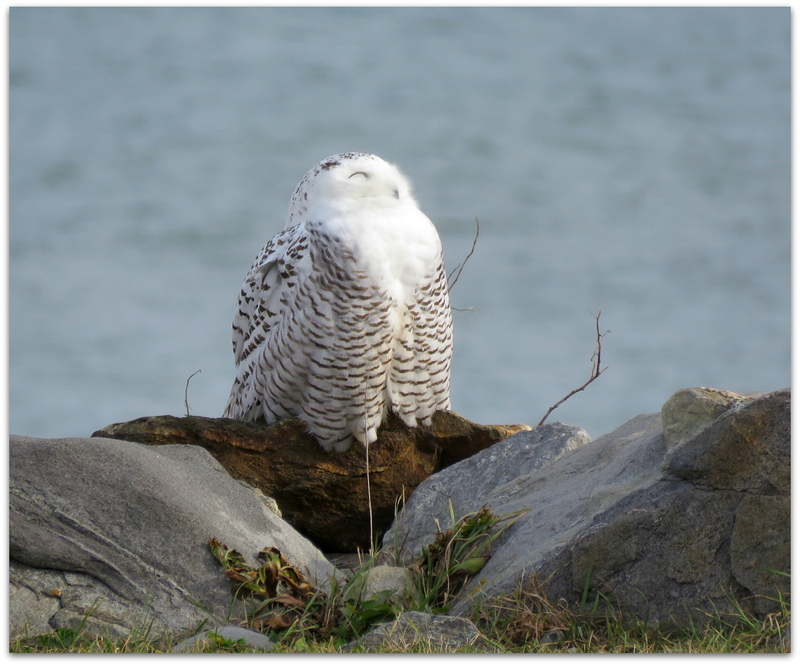 I read on the NH bird list later that there was also a snowy owl a very short distance away on the restroom roof in Rye Harbor State Park, aka Ragged Neck. In the neighboring marsh, the tide was high and a male Common Eider was close enough for a few decent photos. A colorful duck of the northern seacoasts, the Common Eider is the largest duck in the Northern Hemisphere. The male’s bright white, black, and green plumage contrasts markedly with the female’s camouflaging dull striped brown. Their food is “aquatic invertebrates, especially mollusks, crustaceans, and sea urchins.” They dive to the sea floor to take their prey. Also spotted fishing in the marsh, a Common Loon molting from winter to summer plumage. Sign of spring! Yesterday was very warm for March in the New Hampshire Seacoast, with temps around 65, bright sun and a southwest wind. So good. This entry was posted in Uncategorized and tagged birds, Common Eider, Common Loon, Seacoast NH, snowy owl on March 10, 2016 by Amy. Spotted Bubo scandiacus, fulfilling their hopes! It’s a rare gift from the north, our Christmastide owl. 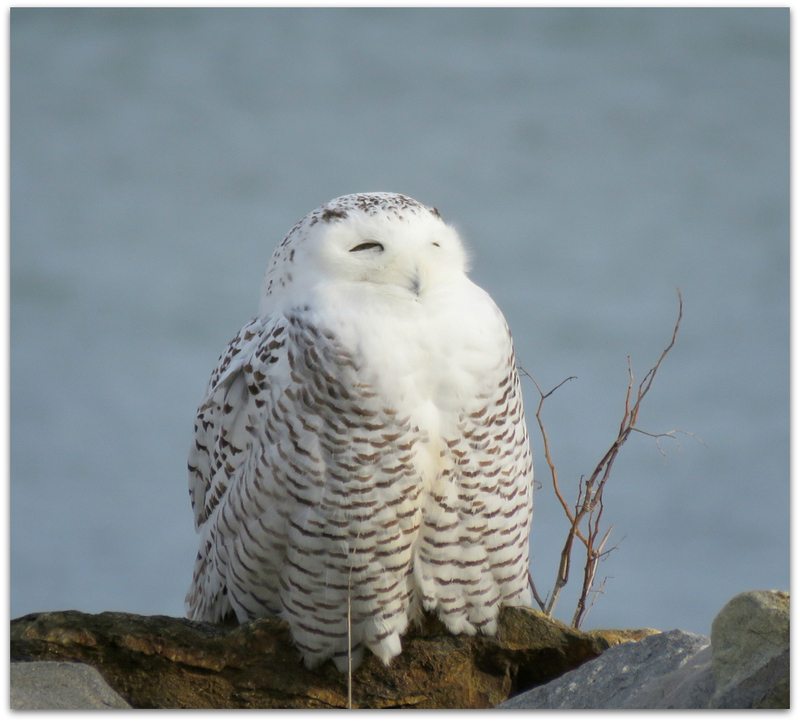 This entry was posted in Uncategorized and tagged birds, christmas, Seacoast birds, Seacoast NH, snowy owl on December 6, 2014 by Amy. 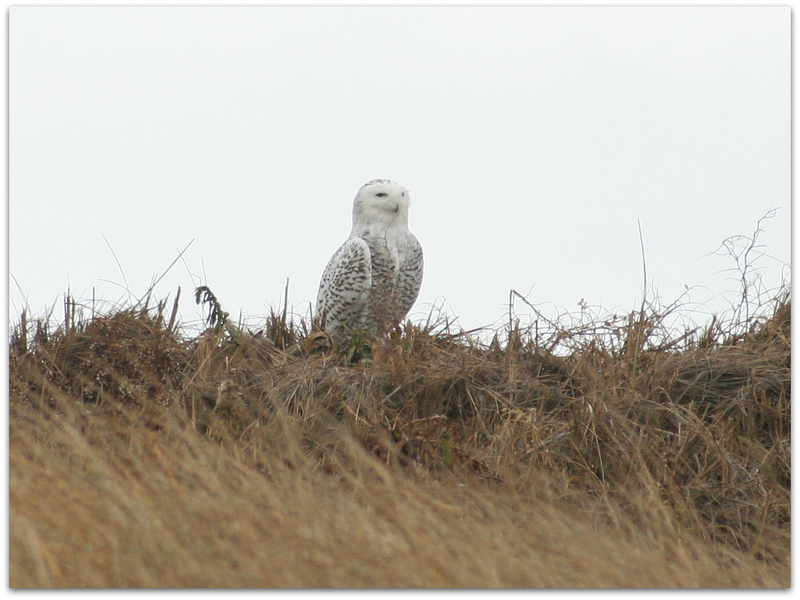 Not my backyard, but just a few miles away… SNOWY OWL. This bird was sitting on top of a dune at Hampton Beach State Park, not far from the inlet, around 1 p.m.
Will it stay for the winter? Or move further south down the coast? Will this year be another banner year for winter owl watching? Stay tuned. 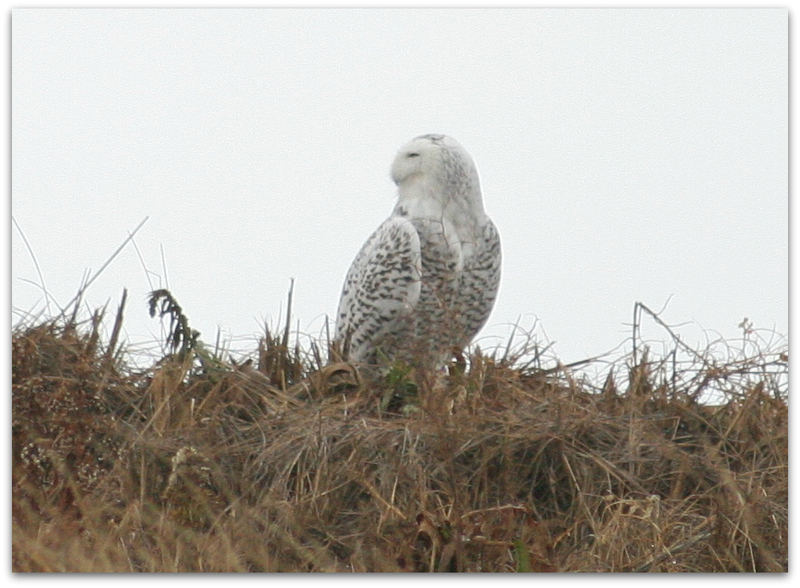 This entry was posted in Uncategorized and tagged birds, snowy owl on November 25, 2014 by Amy.